by dave at Oct. 7, 2013, 4:16 p.m.
A screenshot from the upcoming Project Nightjar game - the genetic programming pattern generator is now working in a simple test framework, and even with myself as the only player at the moment, it's gradually producing eggs that are harder and harder to find against one of the background images from the field site in South Africa. Today I've been working on a viewer for the pattern genome itself, which displays all the base images and the operations and intermediate steps as it builds up the final image. Unlike any natural form of genetics, genetic programming is all about growing trees of functions connected together, and here we are interested in combining simple images using HTML5 canvas's composite operations to make complex patterns. 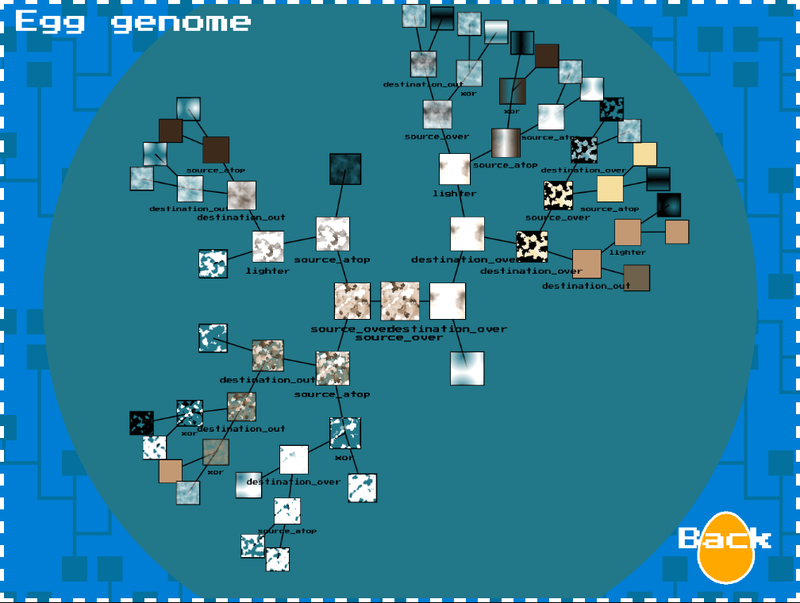 This will be useful for debugging mutations, where the sub-trees are jumbled up, but as we're building a citizen science game, we're also going to be exposing as much as possible about how it's working - from the game mechanics like this to the underlying camouflage theories we'll be testing. If you recognise the graph drawing algorithm, I've been plundering a long forgotten project: fastbreeder.